The purpose of team coaching is to drive the team towards accomplishing a goal, whether it be completing a particular project, starting a new business unit or meeting sales efforts. 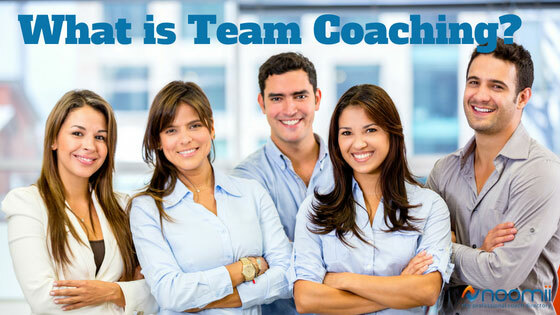 Team coaching involves one outside coach and a team of people in an organization. 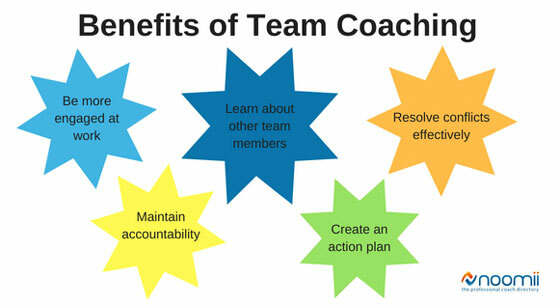 Team coaches are brought in to work with teams to help accelerate their performance. The normal progression of a team consists of four stages, starting with forming - where teammates are introduced, rules are established and objectives are decided upon. Next, the team moves to storming - where personalities clash and disagreements occur. This is acompletely normal part of team progression, although some teams have a higher degree of storming than others. After storming comes norming - where the conflicts have been settled and teammates learn how to work together efficiently and effectively. The final stage is performing, which is where teams start producing results and accomplishing the objectives they started out to achieve. 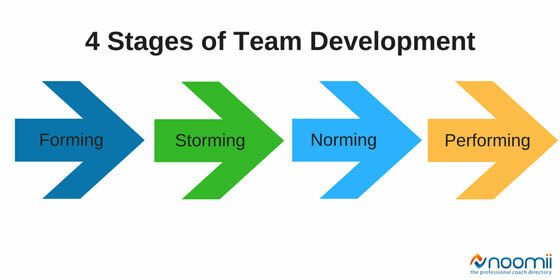 Sometimes teams get stuck in the storming stage or never really move past norming into performing. Or sometimes a team may be performing then slip backwards into a storming phase if conflict arises. Every time the team adds or loses a new member, it must start back at the forming stage again. An effective coach can assist with all four of these levels so a team doesn’t stay in one phase longer than necessary, moving the team to the performing phase more quickly. What do Team Coaches Help With? It is important to know that an effective coach does not need to be an expert in your industry. A coach does not give advice or solutions. A great team coach will be skilled at active listening and be able to ask curious questions without judgement or trying to sway the group decision to one way of thinking. A team coach will ask questions that help the group decide what is best for the team. Team coaching can provide multiple benefits to the individual, the team and the organization. Depending on the set-up of your team coaching environment and the needs and goals of your organization, there are many benefits that could be realized. A team coaching scenario is typically comprised of a team that is working on a goal and a coach from outside of the team. The coach can be an internal (inside the organization) or external coach (see: "How do I find the right team coach?" below). The purpose of having a team coach from outside of the team ensures that the coach is neutral and detached from a position or way of doing things within the team. The coach is focused primarily on the success and effectiveness of the team, rather than whose suggestion they use. Team building is an important tool to create and foster interpersonal relationships within the team. Some popular team-building activities are off-site activities or exercises that encourage members to trust and work together. They are often fun and usually take place outside of the regular office environment or meeting room. A team-building activity could be as complex as an off-site ropes course activity or resort vacation or could be as simple as having a potluck lunch in the office one day or taking the team out to lunch. A team building activity is focused on getting people in the team to know each other better and to create a bond. Team coaching involves an experienced coach working with a team to achieve a goal. Team coaching can happen in a classroom setting or virtually, via phone or video calls. Team-building is typically a one-time event, whereas team coaching happens over a period of time, until the goal is reached. Team coaching can also have the added benefit of creating a stronger bond between team members, because they are working together to achieve a specific objective. What is the Difference Between Team Coaching and Group Coaching? Team coaching and group coaching are similar because they both have one coach working with a group of people. The difference is that team coaching moves the team towards a goal and group coaching enhances the group’s understanding of a topic so they can apply new knowledge to their own goals. In some cases, aspects of team coaching and group coaching can be used together. Team coaching focuses on moving the group of people down a path toward a desired objective. The team is working as one unit, utilizing each person’s strengths to reach the goal. A coach helps work through conflicts and keep the team on track, while encouraging collaboration. Group coaching is one coach working with a group of people; the difference is that instead of working towards a goal, the group is focused on a topic. They then take that topic and use it individually in their jobs. For example, a group of people could hire a coach to work with them on enhancing their leadership skills. The group can be from the same team or from various departments; it could be from the same level in the organization or a variety of levels; the group of people could even be from different companies gathering together to learn about leadership. The difference between group coaching and a training class is that a coaching program lasts for several sessions or months, and the coach will not “teach” a subject, but rather encourage group members to share their experiences with each other for a collaborative learning process. Coaching holds members accountable for taking action in between sessions, whereas a training class is often a one-time, one-way instruction with no follow-up to assess application to the job. How Long is the Team Coaching Process? The team coaching process will likely last for the duration of the team’s efforts. Once the team reaches its intended goal, the coaching process will dissolve. The duration of this process depends on the complexity of the goal. Some teams may reach their goal within a couple of months. Some teams may need coaching for many months or even years to reach their target. Once a team finds a coach they like, that helps them reach their goals successfully and collaboratively, they may decide to engage in another team coaching process as it moves on to its next project. How Do I Know I Need a Team Coach? If your company has a culture of in-fighting, people working in silos, poor communication or high turnover, team coaching can help. There are many types of teams that can benefit from a team coaching process. A team coach can work with leaders to reach a project goal effectively and efficiently. For example, a senior leadership team realizes the need to update the company’s long-term objectives. They decide to use a team coach to ensure that everyone contributes equally, make certain that their meetings are worthwhile, ensure that they complete deliverables in between meetings and ensure the goal is achieved on time. The added benefit is that when leaders are coached, they experience the positive effects of coaching and can actively apply coaching skills within their organization. Studies have proven that organizations whose leaders have effective coaching skills have a culture that is 36% more collaborative, 18% more likely to have an improved revenue, and a 32% lower turnover rate than companies who don’t have leader coaches. A coach can assist a department in reaching an important milestone or completing a critical project. For example, a company decides to move away from the traditional annual performance review and utilize a monthly coaching check-in. The HR department sets a goal to make the transition in six months and hires a team coach to ensure they are looking at all the consequences that will result from this change, create an action plan to implement the new program rollout and hold team members accountable for their deliverable items. A skilled team coach asks questions that allows for diversity of thought and keeps the team moving forward toward its goal. A team doesn’t have to happen inside a company. A team could exist from a group of people coming together to create a common goal, whether it’s in a church, a school or a community. For example, a non-profit organization decides to create a new event in the community to increase awareness of their organization and raise money. A coach can assist this project team to create a timeline, ensure they meet deadlines, ask questions that lead to further insight and help the team meet their goals. How Much Does Team Coaching Cost? Most team coaches charge rates that are comparable to other consultants, with just as much variability depending on the project and the experience of the coach. We’ll explain that in more detail below. As mentioned earlier, coaches charge rates similar to consultants and other business professionals. Hourly rates vary greatly, with team coaches charge anywhere between $100 to $500 per hour. Coaches will charge more for businesses because there is more background work in understanding the unique challenges of the business, industry, and individuals involved that the coach must do and research to be effective. It truly depends on your project. However, you can find coaches who fall outside of that range. A team coach can help your group achieve success but you still need to take responsibility for the changes you want to make. They aren’t going to do the work for you. For that reason, some coaches ask for a three, six, or 12-month commitment. Before they invest the time and energy into working with you, they want to know that you are committed to improving. How Do I Find the Right Team Coach? What is your experience coaching teams? What has been the result of your team coaching experiences? What goals have teams reached as a result of your coaching them? What industries have you coached? You’ll find that some coaches have an ICF credential in the form of ACC, PCC or MCC. These are progressive coaching credentials that indicate a coach who has undergone formal training and has completed a certain amount of coaching hours. Training and credentials can be important, but be sure to also look at the coach’s experience. Many coaches have niche on-the-job experiences that can be just as valuable as a formal training program. Noomii has hundreds of team coaches from dozens of cities around the world. Browse our directory of team coaches or submit a personalized coach recommendation and they will find retirement coaches for you! LOOKING FOR A TEAM COACH?